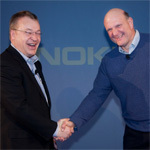 Nokia, Microsoft Deal Gets Signed, Volume Shipments "On Schedule"
Roughly 10 weeks after Nokia and Microsoft announced an alliance to build a series of Nokia Windows phones, the two companies today signed the definitive agreement for their strategic partnership. We don’t learn much new from the blog post and video announcing the inking of the deal, except maybe that hundreds of people are already working together toward a multi-year product roadmap and are ‘on-schedule’ to deliver volume shipments in 2012, and possibly make first delivery in 2011. ESPOO, Finland & REDMOND, USA – After 10 weeks of intense collaboration, we are pleased to report that Nokia and Microsoft have signed the definitive agreement for our strategic partnership to build a new global mobile ecosystem that is unlike any other. But collectively we’ve moved from intent to agreement in such a short period. Actually, it’s even faster than we expected which makes this a perfect example of our commitment to our partnership and the speed at which we plan to move together. On tidbit of news from the announcement: Nokia and Microsoft are making Windows Phone developer registration free for all published Nokia developers in an effort to entice more developers to start building apps for Windows Phone.